English : Neutrophil engulfing anthrax bacteria. English : Petronas Towers, Kuala Lumpur, Malaysia. Ancient cross close to Crazywell Pool on southern Dartmoor. English : Ancient cross close to Crazywell Pool on southern Dartmoor. The archetypal poisonous mushroom Amanita muscaria or "Fly agaric toadstool". Growing under a stand of Pinus radiata in Wellington, New Zealand. English : The archetypal poisonous mushroom Amanita muscaria or "Fly agaric toadstool". Growing under a stand of Pinus radiata in Wellington, New Zealand. Bois du Cazier, a ruin of a colliery in Marcinelle, Charleroi, Belgium. 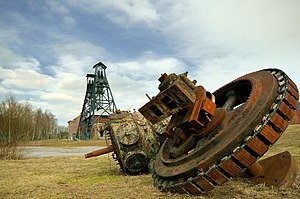 English : Bois du Cazier, a ruin of a colliery in Marcinelle, Charleroi, Belgium. Sikh pilgrim at the Harmandir Sahib (Golden Temple) in Amritsar, India. English : Sikh pilgrim at the Harmandir Sahib (Golden Temple) in Amritsar, India. The Transit of Mercury on November 8, 2006. English : The Transit of Mercury on November 8, 2006. Robert De Niro at 43rd Karlovy Vary International Film Festival. English : Robert De Niro at 43rd Karlovy Vary International Film Festival. Panoramic view of the Ostrachtal near Bad Hindelang on a sunny summer day. English : Panoramic view of the Ostrachtal near Bad Hindelang on a sunny summer day. English : A "Lion's Mouth" postbox for anonymous denunciations at the Doge's Palace in Venice, Italy. Text translation: "Secret denunciations against anyone who will conceal favors and services or will collude to hide the true revenue from them."